Belarus has seriously violated the international arms embargo on Ivory Coast, UN chief Ban Ki-moon says. The former Soviet republic was delivering three attack helicopters and related material to forces led by Laurent Gbagbo, his spokesman said. President Laurent Gbagbo is refusing to hand over to Alassane Ouattara, widely seen as the winner of November's poll. Clashes between the two sides has prompted the UN to warn the country is at risk of relapsing into civil war. An armed rebellion in 2002 split the world's largest cocoa producer between the north, held by New Forces rebels, and the government-controlled south. Belarusian foreign ministry spokesman Andrei Savinykh rejected the accusations as "groundless", AP news agency reports. But Mr Ban's spokesman said the first delivery had reportedly arrived on a flight which landed late on Sunday and additional flights were scheduled for Monday. "This is a serious violation of the embargo… which has been in place since 2004," the spokesman said. "The violation has been immediately brought to the attention of the Security Council's committee charged with the responsibility for sanctions," he said. UN peacekeepers are currently providing protection to Mr Ouattara, who has been holed up in a hotel in the main city of Abidjan since the election results were announced in early December. 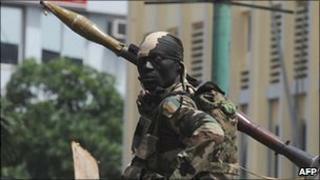 Much of the recent fighting has centred on the main city of Abidjan between rival supporters. However, skirmishes in the west of the country last week between the former rebels and pro-Gbagbo forces has seen the number of civilians fleeing to neighbouring Liberia surge. It was the first time the ceasefire between the two armed sides had been broken in six years.